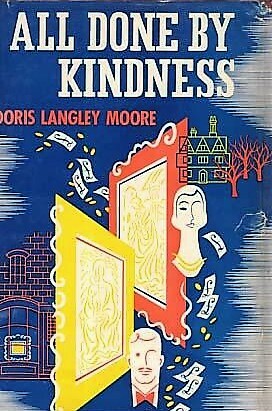 My friend Deb recommended that I read All Done by Kindness based on a post she read by Furrowed Middlebrow. Such is the power of the web, though, that by the time I looked for it, the few copies available were expensive. I had to borrow hers. Caper books and movies were popular in the 1950’s and 60’s, and All Done by Kindness fits the description, telling the story of a crime committed with worthy motives, a light-hearted caper with a dash of romance. It begins with a visit by Dr. Sandilands to an elderly patient, Mrs. Hovenden. Mrs. Hovenden’s family has been wealthy, but since the war, Mrs. Hovenden has fallen into hard times. She tells the doctor she is badly in debt for the first time in her life. Dr. Sandilands offers to lend her the money, even though he can hardly afford it, but Mrs. Hovenden is too proud to take it. Instead, she offers to sell him some boxes of clothes and linen from her attic, including a box of pictures. When the Sandilands family opens the boxes, the results provide Beatrix Sandilands, the doctor’s sharp-tongued daughter, with a great deal to say, for everything is either worthless to begin with or is mouldering away. About the pictures, however, daughter Linda suggests that they consult her knowledgeable fellow librarian, Stephanie du Plessis. Stephanie thinks that the paintings might be quite valuable, even Old Masters. She does some research that indicates they may have been removed from an Italian villa. Beatrix thinks they are worthless and wants them out of her house. Finally, the family agrees to consult Sir Harry Maximer, an art expert who has the reputation for integrity. Here, the plot thickens, for Sir Harry recognizes the paintings as Old Masters, but he tells Dr. Sandilands they are only good copies. Why? Because he intends to have them in his own collection. This is a charming little novel, a delightful book for when you want to read something light. Here is another book for the R.I.P. Challenge. Fool’s Gold by Dolores Hitchens is the last novel of my Women Crime Writers collection and my least favorite. Although several of the novels were noirish, this one is definitely in the noir style. Skip and Eddie are two young men who have already served time in prison. Both are attending night school but have little hope of finding a job. In fact, Skip is already planning a robbery based on information he has received from Karen, a girl in his class. She has told him about a stack of money hidden in the room that Mr. Stolz, a frequent visitor to her aunt’s house, keeps in his room. This crime is poorly planned, but things begin to go wrong before its execution, when Skip’s uncle turns it over to some professionals in exchange for a cut in the proceeds. Skip is determined that no one will deprive him of his big haul. We are supposed to feel some sympathy for Eddie, who would like to go straight. Skip is the one with the big ideas, who moreover is inclined to abuse Karen. But Eddie is too easily led to feel much sympathy for, and Karen is an outright idiot. Most of the rest of the characters are despicable, and we watch as everything goes badly wrong. Here’s another book for the R.I.P challenge! 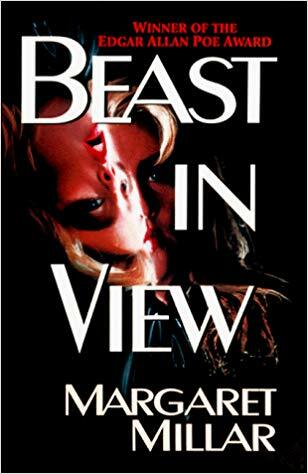 Beast in View is quite the creepy tale. 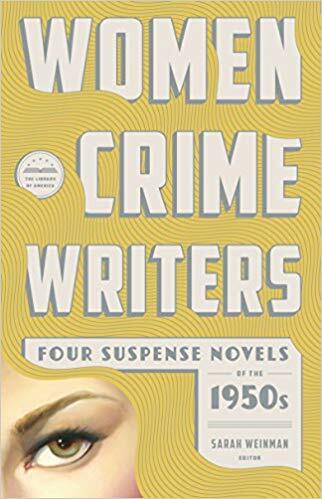 One of the novels in my 1950’s Women Crime Writers collection, it makes a departure from the others. Miss Clarvoe has been leading an isolated life since her father died. She fled her home after inheriting most of his money, but she has been too reserved to do much with it except sit in her apartment. That situation is about to change. Miss Clarvoe receives a phone call from Evelyn Merrick. She cannot remember Evelyn, but Evelyn begins to abuse her on the phone and threaten her if she doesn’t give her money. Miss Clarvoe is too embarrassed to go to the police, so she turns to Mr. Blackshear, her investment counselor, and asks him to find Evelyn Merrick. While Mr. Blackshear investigates, we follow Evelyn as she commits a series of malicious acts. We soon realize that Evelyn is mad. Eventually, a murder is committed. This novel builds up a terrific amount of suspense. It also has a mind-boggling conclusion. I have not been disappointed in this collection. All of the novels included in it have been excellent. 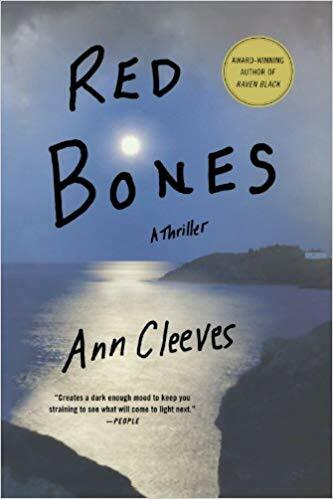 In this third book of Ann Cleeves’s Shetland series, Sandy Wilson, an officer at the Lerwick station, is visiting his parents on Whalsay Island when he discovers the dead body of his grandmother, Mima. The death appears to be an accident. A neighbor out hunting may have hit her in the dark. But what was she doing outside in the first place at that time of night? Jimmy Perez comes over briefly to look into the death, but although he feels something is wrong, he has no evidence to indicate that anything different has happened. After he returns to Lerwick, though, he gets a call from Hattie, an archaeology student working on a dig on Mima’s property. She says she must talk to him and asks him to return. When he gets back, she too is dead of an apparent suicide. To Jimmy, it just doesn’t make sense that she would make an appointment with him and then commit suicide. In fact, most people who knew her said she seemed happier than usual. Jimmy is waiting for carbon dating of some old bones found on the site. But he begins to feel that the island is full of secrets. This was another good mystery in the Shetland series. The series has an appealing detective and an evocative setting. I’m enjoying it. In addition, I have just read the Get Your Goth On Dare at Classics Club, so I have decided that I will take up that dare. During the month of October, I will read The Haunted Hotel by Wilkie Collins for the dare. I picked it for obvious reasons. Ten years ago, Abigail, a fifteen-year-old girl, was discovered dead by her best friend, Emma. Abigail’s father’s spurned lover, Jeanie Long, was found guilty of the murder. Police have now received belated testimony confirming Jeanie’s alibi. She was not guilty. It is too late for her, though. When her request for parole was turned down a few days earlier, she hung herself. 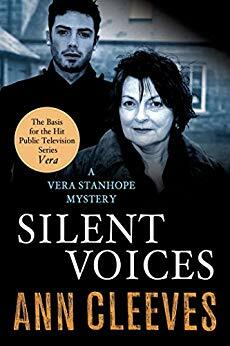 Vera Stanhope is called in to find out how the investigation could have gone so wrong. Right off the bat, she finds that Jeanie was convicted on no forensic evidence. Looking further, she finds indications of conflict of interest in the case. On hearing the news about Jeanie, Emma’s younger brother Chris returns from university. He seems to be visibly upset and tells Emma he followed Abigail everywhere the summer she was killed. The next day, he is found murdered. 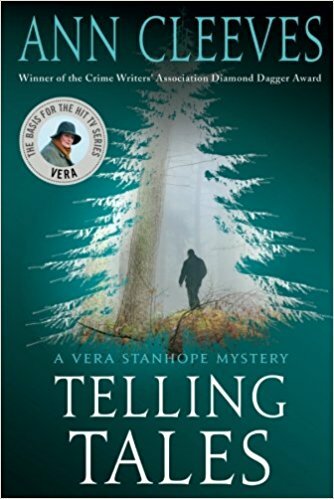 Vera guesses that he must have witnessed something ten years ago that made him realize now who the murder was. As the villagers’ secrets begin to come out, Vera finds several people to suspect of murder. This novel is truly suspenseful at times, and I never came near to a solution of the crime. This is proving to be a good series. 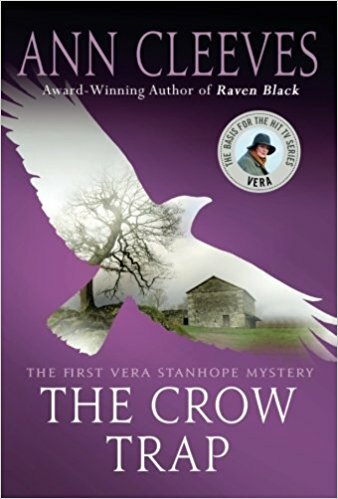 The Crow Trap is Ann Cleeves’s first Vera Stanhope mystery, set in the North Pennines in Yorkshire. It is unusual in that Vera is barely a character until halfway through the novel. The first half is narrated by three different women who are doing an environmental impact study for a proposed quarry. They are staying in a remote cottage called Baikie’s that is used by students doing research. Rachel is the head of the project, and she arrives to discover the body of her friend, Bella, in the barn of the nearby Black Law Farm. Bell has apparently committed suicide and left her body in a place where it would be discovered by Rachel rather than by her invalid husband, Dougie. Rachel is disturbed by this suicide, because she can’t think of a reason for it. Anne is at the cottage to survey plant life. But she is already involved in a way that may be a conflict of interest with Godfrey Waugh, the married man who will decide whether to excavate the quarry. She is irritated by both other women, especially with Grace. Grace is there to survey wildlife and has been reporting an astonishing number of otters, to the point where Anne is suspicious of her numbers. Grace is very quiet, sharing almost nothing of herself with her work mates, sleeping little, and hardly eating. Then Grace is found murdered nearby the cottage. Vera, an eccentric-looking woman, begins investigating the women and the quarry deal. But she views the two women still working in the cottage as a crow trap, a cage containing a crow that is there to attract another crow. She thinks the killer will strike again. Although this mystery spends so much time on background that some may find it a little slow moving, that is one of the features that makes it stand out. There is some information about the killer that the reader can have no way of knowing, but there are hints enough that it is possible to guess the right person. In any case, I thought this was an excellent mystery, complex and interesting. The characters seem real. The Yorkshire setting that is so evocative in the TV series isn’t vividly evoked, nor are the accents, but that’s a slight fault.